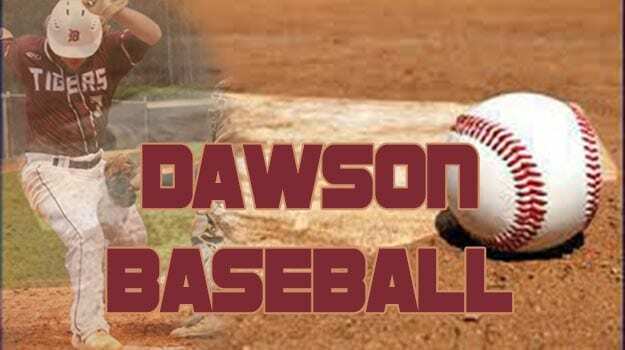 With only six games left in the regular season, the Tigers of Dawson hosted the Vikings of East Hall on Monday in game one of a three game series. This, being the second to last series of the season, the Tigers were looking to take a big region win . A low scoring affair had the fans from both the Vikings and the Tigers on the edge of theirs seats for the entire game. The Tigers sent Palmer Sapp to the hill to do his best to hold down the powerful offense of the Vikings and that he did. Sapp went all seven innings allowing two runs(one earned) on three hits, four walks and He didn’t strike out anyone. Offensively for the Tigers, Connor Bearden(2-3), Kristian Kelley(1-3) and Chandler Caine(1-1) all reached on base hits while the only run scored for the Tigers is credited to T.J. Allen with the RBI. Neither team produced a lot of offense for the next five innings and weren’t able to plate any hitters. The Viking scored their runs in the first and second innings to seal the victory over the Tigers by a score of 2-1. The Tigers will make the trek to Gainesville on Wednesday to face the Vikings in game two starting at 5:55 pm.